The Mummy. Universal Pictures 1999. 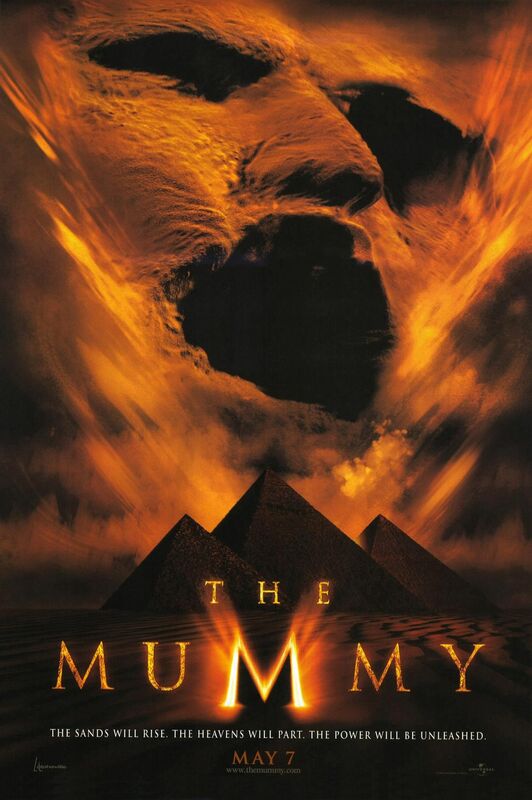 I only very recently, perhaps in the last year or so, learned that this movie is a direct reboot of the Universal Monsters version of Mummy lore. The original Universal Mummy may have greatly influenced popular perception of mummies, but it’s perhaps the most generic legend in the franchise. Even werewolves, which are perhaps more independent, have a greater connection to The Wolf Man than mummies. Additionally, I always thought of this as a fantasy action film, while the 30s film is, like the rest of the 30s and 40s films, definitely positioned as horror. Perhaps the genre shift accounts for the unpopularity I perceive this movie to have, though I’m not sure it’s actually all that unpopular, considering it had a handful of sequels and starred Brendan Fraser at the height of his fame. On the other hand, maybe the sequels are on the strength of the overall franchise. I may understand better after watching. Centuries ago, the Pharaoh’s high priest Imhotep and the Pharaoh’s mistress Anck Su Namun fell in love, and broke the no-touching law upon her. When they were discovered, they killed the Pharaoh, but that didn’t stop the Pharaoh’s bodyguard from killing them and all of Imhotep’s priests, as well as placing the highest of curses upon Imhotep to prevent him from being resurrected. In the early 20th century, brilliant Egyptologist Evy and her less-brilliant brother Jonathan find a puzzlebox with a map to the legendary City of the Dead, and get the American who found it, Rick O’Connell, out of the hangman’s noose to lead them to where he got it. They and a rival team inadvertently awaken Imhotep, who sets out to fully restore himself by draining life from those who found his book and bring back his lover via human sacrifice of Evy, with the power of the Plagues of Egypt behind him. While there are the trappings of the period between world wars, the characters are 100% modern. Aside from Imhotep, every named character feels like someone from the 90s. This makes the plot more accessible, but contributes to the theme park feeling already present in spades from the casual appropriation of Ancient Egyptianishness. The only moment anybody felt less than modern was when Rick decides that since Evy is directly threatened, the men should go do the things and she should stay locked in her room, and responds to her protests by simply picking her up, carrying her to the next room, tossing her onto her bed, and locking the door on his way out. I’m not sure why I responded so well to Evy objecting to being damseled when most outspoken independent female characters still get put into perilous positions and practice their outspokenness by complaining about it, but I got the sense she was in some way slightly more self-aware about her situation than most. Imhotep’s goal of resurrecting his lover is possibly the only element remaining from the original movie, but it’s given so much attention that it seems he and Anck Su Namun should be more sympathetic than they’re portrayed. His entire motivation is getting his lover back and possibly revenge against… the Pharaoh who’s already dead? The Pharaoic system that’s long since fallen? It would make sense that he would have so little care for anyone else that he’d use everything at his disposal, including stealing others’ body parts and life force and utilizing the Plagues as is practical, to return her and himself to full life, but everyone including the narrative assumes that he’d proceed from there to enslaving the world when it seems like his to-do list ends with “be reunited with Anck Su Namun”. Maybe they would have settled down in a cottage together, nobody knows. His characterization does seem to trend away from that possibility, but he doesn’t seem to have a reason to. The idea of the Plagues being under Imhotep’s control seems to come from a combination of a living corpse not being scary enough and Exodus being about half of what modern audiences know about Ancient Egypt. As a whole, they were given to him in story as a reason to keep his followers from resurrecting him, but they have varying degrees of sense. Some of them just announce his presence, and summoning locusts is useful, but he can also take living slaves by giving them “boils and sores” and thus by baffling logic turning them into zombies. It’s possibly the least justified part of the movie. CGI was not ready for what was being asked of it here. Sometimes it’s not even being asked to do appropriate things, like Imhotep opening his mouth really wide for intimidation purposes. It’s just not a very good idea. Blowing sand was the only thing that aged well. As an aggressively modern movie that prioritizes action over logic, this movie does all right. By being set between the wars and having a bent toward mystical artifacts, I’m going to draw comparisons to Indiana Jones and to The Phantom, and possibly nothing can measure up to the latter for me. I completely understand the shift from horror to action. Modern horror movies just don’t find a single walking corpse scary, so why not arm him with magic and undead soldiers and trade suspense for thrills? It leaves the franchise a gutted, shambling, undead corpse with little more than a name to stand on, but what franchise isn’t anyway? At least the result was a fun movie.